A father and his six year old son were forced to flee their home Thursday night due to the effect of high winds associated with the passage of Tropical Stork Kirk. The incident occurred at Vieux Secrieux, Gros Islet. Relatives and neighbours have since helped the family to rebuild the house. 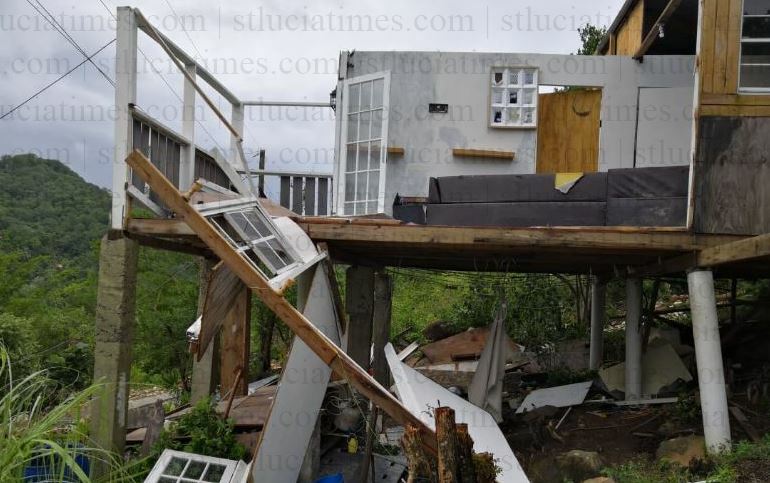 Roberto Soudine told St Lucia Times about 9.00 PM Thursday night while his son slept, strong winds blew away his roof and caused other damage to the property. He said he grabbed his son and ran to a neighbour’s home. Soudine disclosed that no one was injured. He said although his son was traumatised, when relatives later came to assist and the boy was able to interact with other children, his state of mind improved. “My family, all of us came together and we put it back up,” he said of his damaged home. However he explained that everything in the two-year old house that he himself built sustained water damage from the heavy rainfall associated with Tropical Storm Kirk.